During February 24-26 2012, the International Joint Conference on Computer Vision, Imaging and Computer Graphics Theory and Applications (VISIGRAPP2012), was held in Rome, Italy. This conference aims at becoming a major point of contact between researchers which covers different aspects related to Computer Graphics, from Modelling to Rendering, including Animation, Interactive Environments and Social Agents In Computer Graphics. In this conference, I has made an oral presentation on "Generating Stylized Dance Motion from Labanotation by Using an Autonomous Dance Avatar". "The latest technology and trends in Motion Capture Systems"
"Simulation of Dancing Groups using Motion Data"
"Vibration Reproduction for a Virtual Yamahoko Parade System"
"The Evaluation of LabanEditor3, an Interactive Graphical Editor, from a Choreologist's Perspective: the Case Study of Noh Play and Classical Ballet"
"A Study of Molecular Model Display System using Augmented Reality"
"Comparing Timing of Interpersonal Up-down Dance Coordination by using Motion Capture"
"Possibility of the Motion Capture System in Fieldwork"
"Quantification of Open Communications Structure in Duo-Comic Acts Manzai"
"Study on Educational Support System and Measurement of Nihon Buyo by Motion Capture"
The symposium "Human Body Motion Analysis with Motion Capture" ("Motion Capture Symposium" for short) is organized by the Dance Archive Project under the Global COE Program. The project and the symposium were originally started in the year 2003 under the former COE Program called 21st Century COE Program. The purposes of the Dance Archive Project include: (1) Digital archiving human body motions of intangible cultural properties especially traditional dance by using a motion capture system, (2) Numerical and quantitative analysis as well as qualitative analysis of dance body motion data, (3) Analysis and evaluation of body motion by utilizing biophysical and biomechanics information, (4) Research on representation of dance body motions and interactions with virtual dancers in virtual environments. The project consists of faculty members, researchers in our university and also visiting researchers from other universities in Japan. They are from both engineering and humanities backgrounds. This year the symposium celebrates its 9th year. We invited Prof. Nadia Magnenar-Thalmann at Nanyang Technological University, who is one of the most famous researchers on CG and VR, to give us the invited talk on her latest research topic "Videocapturing for Medical Applications". We also invited Mr. Bo Wright at Motion Analysis Studios to give us a special talk on "The Latest Technology and Trends in Motion Capture Systems". 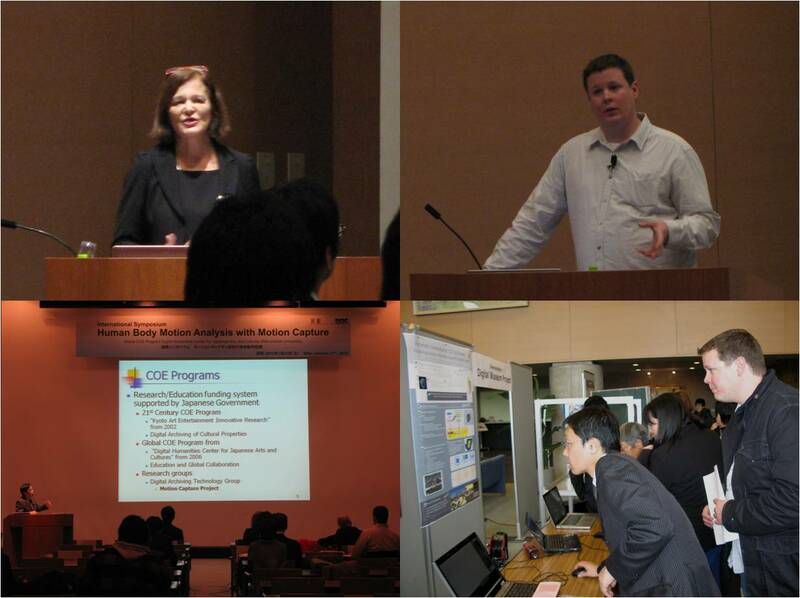 Other researchers also introduced their latest researches in general session. A demonstration session of MEXT Digital Museum Project was organized at the same venue. The researchers exchanged their innovative ideas in an open atmosphere.